SAN FRANCISCO, July 5, 2018 /PRNewswire/ — Leaders need to know that hidden wealth resides in three places in their organizations: their people, their creativity, and their leveraged interactions. Tom leverages his background as a medical school scientist and professor, founder of an award-winning science and technology firm, and a certified management consultant. Yet, Tom advises that investing in an organization should not be random and should not be solely to make a good ROI. Ideally investments should be a strategic decision that leads to an expected outcome beyond a desired ROI. 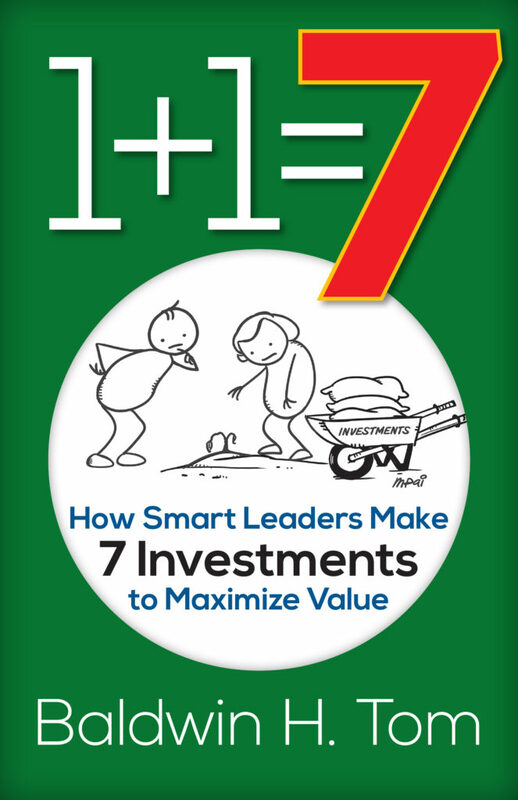 In the book, “1+1=7” Tom introduces readers to the seven capital investments that are available to every enterprise. The seven investments include 1) Human, 2) Relationship, 3) Spiritual, 4) Customer, 5) Organizational, 6) Physical, and 7) Financial. According to Tom, various combinations of investments can lead to 1) improved leadership and management, 2) better communications, 3) a new organization culture, 4) resiliency and sustainability against competition, 5) greater creativity and innovation, and 6) more products and services that increase intellectual property. Seven investments control the success and failure of businesses. Five of the seven investments (71%) are people-focused or derived with two focused on the task (work) side, so people are clearly the most important asset. Judicious investing in the seven capitals will generate significant ROI that leads to transformational change. The health and welfare of a business can be assessed with the seven investments. Experts predict the HR executive will soon focus more on generating value and wealth when dealing with personnel, than mere employee placement. When there is an investment in technology or other tangible resource, Tom says that making a paired investment on a people-side will magnify the value of the tangible investment. New technology paired with enhanced understanding and training of the user is most valuable. Investing in relationships and spiritual capitals that include internal team exercises to build a culture of cooperation, sharing, and congeniality creates a work environment that honors people.